The two conspicuous ferns on the left are Asplenium nidus (bird's nest fern) and, beneath it, Vittaria zosterifolia (strap fern). The photo equipment visible is a Nikon F3, a 55mm f/2.8 Micro-Nikkor (macro lens), a flash bracket that Rudi designed, and an old battered Domke camera bag--all early-1980s-vintage equipment. The time is 16:47, just before a much-needed shower and dinner. 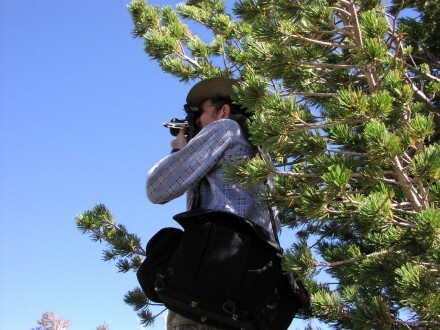 The conspicuous tree is Pinus flexilis (limber pine). The photo equipment is the same Nikon F3, this time with a 35-105mm f/3.5-4.5 Nikkor plus polarizing filter, and Rudi's special flash bracket. The old battered Domke bag was finally retired after the Taiwan trip in favor of the new one seen here. 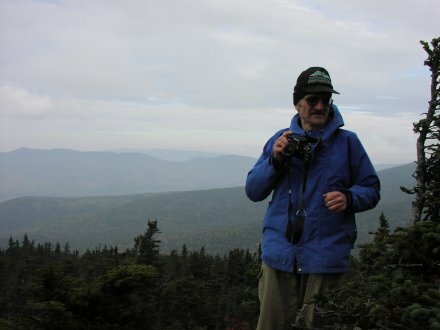 - Rudi, 12 Oct 2002, miserably cold yet gloriously happy, on the summit of Mt. Webster, New Hampshire (1192m / 3910'), with Nikon F3 and 24mm Nikkor. (Photo by Mena Schmid.) 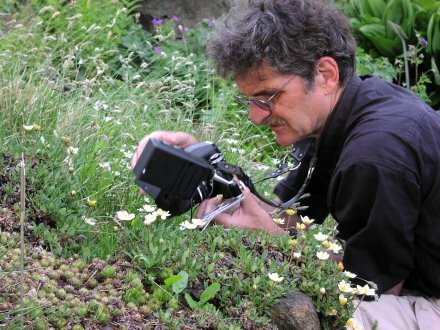 - Rudi, 4 May 2003, amidst Dryas octopetala (Rosaceae) in the Berlin Botanical Garden, with the trusty Nikon F3, 55mm f/2.8 Micro-Nikkor, flash bracket, and strobe. 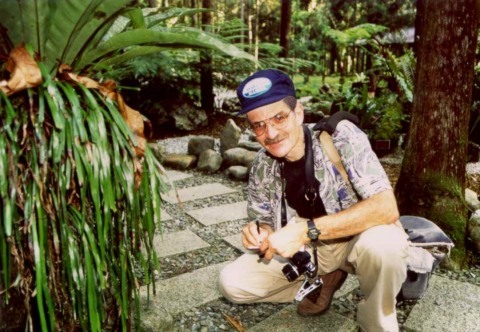 NikonLinks (Maintained by Don Ferrario). The Nikon Links Space (Maintained by Michael McLennan). Nicke's Nikon Page (Maintained by Niklas Nikitin).